HP Umpire Mark Ripperger ejected Mariners P Felix Hernandez for arguing balls and strikes in the top of the 7th and Instant Replay Review confirmed 3B Umpire Lance Barksdale and 1B Umpire Gary Cederstrom's No HR (live ball, in play) calls in the bottom of the 1st inning of the Rays-Mariners game. In the 1st, with none out and one on, Mariners batter Robinson Cano hit a 0-1 sinker from Rays pitcher Cesar Ramos on a line drive to left field off the wall. Upon Replay Review as the result of a request by Mariners Manager Lloyd McClendon and initiation by Crew Chief Gary Cederstrom, Barksdale's ruling was affirmed, the call was correct. At the time of the review, the Mariners were leading, 2-0. 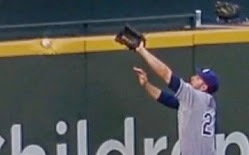 On the very next play, Mariners batter Corey Hart hit a 0-1 sinker from Rays pitcher Ramos on a sharp line drive to deep right field and off the top of the outfield wall. Upon Replay Review as the result of a request by Mariners Manager McClendon and initiation by Crew Chief Cederstrom, Cederstrom's ruling was affirmed, the call was correct. At the time of the review, the Mariners were leading, 3-0. In the 7th, Mariners pitcher Hernandez was ejected during a pitching change. Replays indicate his 1-0 pitch to preceding Rays batter Ryan Hanigan was located over the inner edge of home plate and knee-high, the call was incorrect. * At the time of the ejection, the Mariners were leading, 9-3. The Mariners ultimately won the contest, 12-5. This is Mark Ripperger (90)'s first ejection of the 2014 MLB Regular Season. This is Lance Barksdale (23)'s fourth Replay Review of the 2014 MLB Regular Season. This is Gary Cederstrom (38)'s third Replay Review of the 2014 MLB Regular Season. Mark Ripperger now has 0 points in the UEFL Standings (2 Previous + 3 AAA - 1 Penalty - 4 Incorrect = 0). Crew Chief Gary Cederstrom now has 0 points in the UEFL's Crew Division (0 Previous + 0 Incorrect = 0). This is Crew Chief Gary Cederstrom's 15th, 16th supervised Replay Review of the 2014 season. *UEFL Rule 6-5-c-5 states that an incorrectly ruled ball on a 1-0 count "realistically resulted in a different outcome" of the at-bat. This is the 40th ejection of the 2014 MLB Regular Season. This is the 13th player ejection of the 2014 MLB Regular Season. This is the 268th, 269th Instant Replay Review of the 2014 MLB Regular Season. Prior to ejection, Hernandez's line was 6.2 IP, 8 H, 4 ER. This is Felix Hernandez's first career MLB ejection. This is Mark Ripperger's first ejection since Sept 5, 2013 (Bo Porter; QOC = Y). This is Mariners Manager Lloyd McClendon's 11th, 12th Replay Review of 2014. Umpires are now 142/269 (.528 Affirmation Rate) in Replay Reviews during the 2014 MLB season.